Almost every online citizen abreast with the latest in the mobile technology scene knows that the flavor of Android known as Jelly Bean is the latest and the smoothest to date. But, which Jelly Bean? Two varieties exist for this sweet treat: Android 4.1 (which debuted with the Google Nexus 7) and Android 4.2 (which came out with the Google Nexus 4 and the Google Nexus 10). Should you be gravely concerned that the phone that you’re longing to buy runs only Android 4.1? Or, should you just go ahead and buy an Android 4.2 device such as the Nexus 4 or Nexus 10? Which mobile OS version is better? 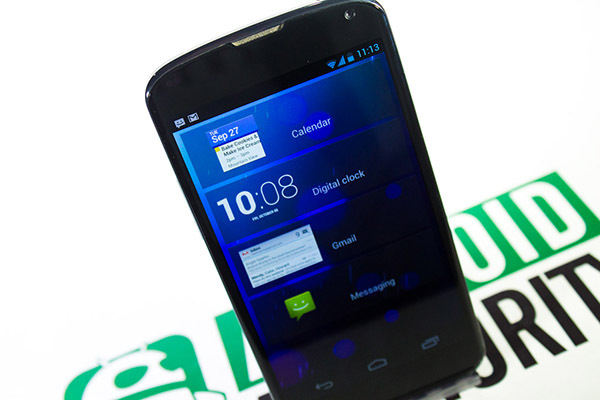 Is it even worth your envy to look at another’s Android 4.2 device? Nexus 10 (running Android 4.2.1 build JOP40D). In this comparison, find out how the two Android versions differ, and whether they differ greatly and significantly. You may also skip ahead to the end of this post to watch our comparison video. Navigation in both Android 4.1 and Android 4.2 remain exactly the same. On the Nexus devices, particularly, you will find virtual Back, Home, and Recent Apps buttons instead of physical capacitive buttons commonly present in most other Android phones. These virtual navigation buttons reorient themselves when switching between landscape or portrait orientations. At times they hide as three gray dots, such as when you’re viewing a photo, or auto-hide, as when you’re watching video. The lockscreen layout and elements on both Android 4.1 and Android 4.2 remain mostly the same, with a few cosmetic and several significant functional changes. To unlock device, drop lock icon on unlock icon on outer ring. Outer ring has shortcuts for Camera and Google Now. To unlock, drag lock icon to outer ring. Google Now can be launched by swiping center (dotted circle) of lockscreen’s bottom edge upwards. Switching from Android 4.1 to Android 4.2 won’t get you a drastically revamped and completely new lockscreen at all; rather, you’ll get the same lockscreen with expanded functionality. You’ll still get the Clock and the lock/unlock icon. Unlocking is still done by dropping the lock icon over the unlock icon on the outer ring. But, in Android 4.2, you do get new ways to view content and launch apps (e.g., email, SMS, calendar events, etc.) directly from the lockscreen, thanks to lockscreen widgets. There’s not much perceptible change on the homescreen either, save for some rearrangement in the default app shortcuts and default folders, as well as the difference in default wallpapers. The default Analog Clock widget on the main Android 4.2 homescreen has also changed, although not necessarily for the better. Notification Shade shows digital clock at left; abbreviated day and date (no year), Clear All Notifications button, and Quick Settings button (on phones only). Quick Settings menu shows profile photo thumbnail, button for Brightness setting, shortcut to Settings menu, shortcut to Wi-Fi settings (shows SSID), shortcut to Data Usage screen (shows mobile network name), auto rotate button (on tablets only), shortcut to Battery status screen (shows charge in percent), toggle for Airplane Mode, toggle for Bluetooth, and shortcut for creating a bug report (if Power menu bug reports is enabled in Developer options). 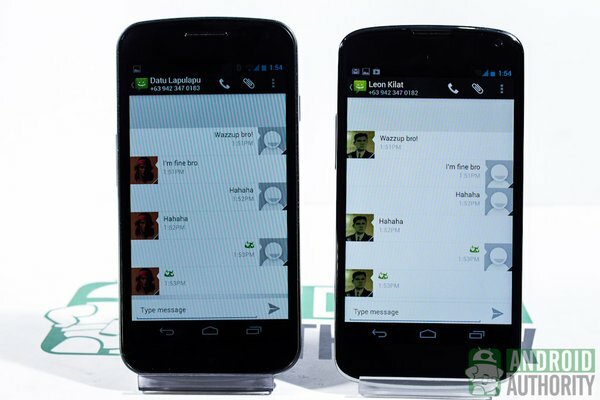 Android 4.2 brought some new and exciting changes to the Status Bar pull-down mechanism. The Notification Shade is still the central place for notifications. Only very little has changed there. I didn’t see any change in the status icons on the right side of the Status Bar either. But, there’s an additional Quick Settings pull-down from the Status Bar. This new pull-down menu is also accessible via the Quick Settings button on the upper-right corner of the Notification Shade. On phones, you can also access Quick Settings by swiping down from the Status Bar with two fingers. But, Android 4.2 also ushers in Gesture Typing to its stock Android keyboard. It’s like the swipe input method which Swype is known for. Some people actually input text faster this way than through tap-typing. Accessibility Shortcut — for quickly enabling accessibility features by holding the Power button then hold down two fingers on the screen until you hear a voice confirmation. Call Logs tab can be filtered to show all calls, only missed calls, only outgoing calls, or only incoming calls. Incoming call screen also shows Google Now shortcut (dotted circle). For email, Gmail is the default client app. And, for those who have POP3, IMAP, and/or Exchange accounts, there’s the stock Email app for Android. This will need some setting up, of course. Both Jelly Beans use exactly the same version (4.1) of the stock Email app for Android. As in Android 4.1, app installation in Android 4.2 requires granting permissions to the app before the device installs it. This is a security feature in Android. I see great improvement in this mechanism in Android 4.2, too. The permission requirements are now grouped and are easier to understand compared to how they were in Android 4.1 or earlier. Android 4.2 takes security several notches higher by including a built-in malware scanner, which scans an app for bad content and alerts the user before app installation. You can clear the data, clear cache, force stop, uninstall, and toggle show notification of an app in the Apps section under Settings. Android 4.1’s Clock app only has a clock function, but Android 4.2 adds two tabs for Stopwatch and Timer in its Clock app. The Analog Clock widget gets a different design from the Android 4.1 Analog Clock widget. It’s not necessarily better-looking — just different. The Digital Clock widget is new in Android 4.2. This one is not available in Android 4.1. Android has finally and completely shied away from the stock Android Browser in favor of Google Chrome, which is now the default Web browser in Android 4.2. The complete disappearance of the stock Android Browser is not all too shocking for users of tablets such as the Nexus 7, since Chrome has been the default browser for tablets since Android 4.1. Both Jelly Bean versions use Google Now as the default search app. The app integrates Google Voice Search, Google Goggles, and Google’s other search services into just one app that shows search results on flashcards. You can access Google Now similarly in both Jelly Bean versions: by tapping the Google Search bar on any homescreen or by swiping the virtual Home button upwards from any screen. Lockscreen access to Google Now differs, however, in the two Jelly Beans. In Android 4.1, quickly launch Google Now from the lockscreen by dragging and dropping the lock icon over the Google Now icon on the outer ring. In Android 4.2, launch Google Now from the lockscreen by swiping its dedicated icon (dotted circle in the middle of bottom screen edge) upwards. The Camera app in either of the Jelly Bean versions can be launched in the usual way: by tapping on the Camera app on either the homescreen or in the App Drawer. Quick launching from the lockscreen, however, differs in both Android 4.1 and Android 4.2. In the earlier Jelly Bean, you can unlock the device and launch the Camera by drag-dropping the lock ring on top of the Camera icon on the outer ring. In Android 4.2 phones, swipe the right edge of the screen to the center to open the Camera widget and launch the Camera. Android 4.2 tablets don’t have a camera shortcut on the lockscreen. If you’re used to the Android 4.0 Ice Cream Sandwich Camera app, using the Android 4.1 Camera app will be a similar ride: The elements and features are similar to those in the ICS camera. The only new change in Android 4.1’s camera is the transition effect when taking a photo and the swipe gesture to view images taken. In contrast, Android 4.2’s Camera app has a simple and less-cluttered layout. Elements found here are the camera mode options, virtual shutter button, and the circle icon for the camera’s settings — only these three. You can also long-tap on the viewfinder to open the camera settings menu. In addition, Android 4.2’s Camera app also has new features such as Photo Sphere and support for HDR Mode for compatible devices. Both Camera apps have similar camera options and effects, however, Android 4.2 decides to get more serious by removing the Silly Faces and Background effects. To enter Filmstrip View in Android 4.1, you’d need to zoom out on an image. Android 4.2’s Gallery app, however, provides a drop-down list to make switching between Grid and Filmstrip Views easier. Also, in Android 4.2, scrolling past the leftmost photo in the Photo Viewer or in Filmstrip View will launch the Camera app. This feature is not available in the earlier Jelly Bean. choose photo transformation options (Crop, Red Eye, Face Glow, Face Tan, Straighten, Rotate, Flip, or Sharpen). image colors and values adjustments (Autocolor, Exposure, Vignette, Contrast, Shadows, Vibrance, Sharpness, Curves, Hue, Saturation, and BW Filter). Captured or downloaded videos are stored in the Gallery app, too. They are organized and sorted in the same manner as photos in the Gallery app. There is only one difference between Android 4.1 and Android 4.2’s Video Gallery: you can trim your videos right within the Gallery app in Android 4.2. This is not possible in Android 4.1. If you grow tired of scrolling through different pictures one-by-one, view your photos as a slideshow. Both Android versions let you run photo slideshows. In Android 4.1, just tap on the Slideshow button at the upper-right corner of the Gallery app. In Android 4.2, the Slideshow option is under Menu while viewing an album. You can also display your photos as a live slideshow wallpaper through the Daydream feature that activates when the phone is charging or docked. The Gallery app in both Android versions also doubles as a video player — a straightforward and simple one. There is no other difference in the video player in either Android version apart from Android 4.2’s support for the Miracast standard, allowing wireless display sharing to supported displays. I greatly appreciate the application verification feature, which examines and checks an app before it is installed, warns the user of potential harm, and can prevent installation of the app if the potential harm is great. The list of Android permissions has also improved a lot. The permissions are now displayed in groups and are described in language that is easier to understand. A description of each permission can also be viewed by tapping on the permission. In Android 4.1, I get a bulleted list of a mix of technical and not-so-technical language. Unlike in Android 4.1, the Developer Options menu is not visible in the Android 4.2’s Settings menu by default. To activate the Developer Options menu, tap the device’s model number 7 times to make it appear. Android 4.2 optimizes tablet functionality by allowing users to create multiple accounts. On the lockscreen of an Android 4.2 tablet such as the Nexus 10, you will find user icons below the lock icon. Tap on the icon of the user profile that you want to load before unlocking the tablet. If the profile is protected by a password lock, you’ll need to enter the password first before the tablet will unlock. Each user account can be personalized so users can safely download files or apps, save images or attachments, and leave their settings without worrying about the next user changing or viewing data. With the new Daydream feature in Android 4.2, you can display the latest Google Currents trends, a photo slideshow, a photo frame, an analog or digital clock, or a colorful background on your device’s screen when your device is charging or docked. It’s actually a customizable screensaver feature. You can also manually activate it, if you want. Not possible out of the box in Android 4.1, wireless mirroring is now possible in Android 4.2. You can screencast your device’s display to an HDMI device (e.g., HDTV) that supports the Miracast standard. This means that you can wirelessly stream your slideshows, movies, videos, and the like (your device’s display, in fact) to a supported HDTV. Unfortunately, only the Nexus 4 has this feature. So many of the goodies that you love from Android 4.1 Jelly Bean have been carried over to Android 4.2 Jelly Bean. Most of the stock apps and widgets are similar in both Android versions. To the eyes, there’s no big change in Android 4.2 at all. Placed side by side, Android 4.2 Jelly Bean shows a slightly modified and slightly upgraded version of Android 4.1 Jelly Bean. What do you think of the changes? Are they big enough for you? Which of the new features or improvements do you like the most? Share your thoughts in the comments.